When Iván Fischer arrived to become the National Symphony Orchestra's Principal Conductor, it was not under the best of circumstances. Leonard Slatkin, asked to leave against his will, was a vital fixture here as important as Placido Domingo, but he had been dogged from the start by a monopolistic line-up of Washington Post journalists, really the only game in town for covering classical music (including one demoted writer who trailed him from the tenure in St. Louis, and another who still takes pot shots at him every chance she gets - I'm sure that classical music critics, especially in this small southern town, are used to being big fishes beyond reproach, but Slatkin fought back in a spirit of making the arts livelier). All the same, his interim replacement Iván Fischer brought the promise of a solid reputation for delivering definitive readings of master composers from his native Hungary; so after all the disappointment, I expected to be hearing much Béla Bartók and Zoltán Kodály for at least a few years. In fact, we didn't get much of that, but when we did, it was grand (especially the Concerto for Orchestra and The Wooden Prince of Bartók). His last concerts here, before passing the baton to Christoph Eschenbach, are upon us; he will continue afterward building the institution he founded, the Budapest Festival Orchestra, since he clarified coming in that he never wished to leave Hungary for a permanent post here. For the final concerts, he will conduct two "audience favorite" works, the now-not-riot-stirring Le Sacre du Printemps by Igor Stravinsky, and the gushingly romantic Scheherazade by Nikolai Rimsky-Korsakov. (I am a weepy sucker for that latter work, while the contrasting adrenaline of the former always seems to me shrouded in Stravinsky's notorious cynical crankiness.) Central to Scheherazade are virtuosic passages for solo violin, and since the work is not a concerto, we have that rare opportunity to hear our concertmaster as the programme's formally featured artist. Nurit Bar-Josef is such the ideal first-chair, not to mention (dare I write) drop-dead gorgeous. Is that allowed? ...Why not? Image/beauty is so wrapped into the identities of celebrities in popular music, and if classical music can be more than just an academic artifact, it deserves the same opportunity for glamour. I suspect that some of these issues were circulating when in 2001 the orchestra snagged its sitting concertmaster, but the presiding fact is that Ms. Bar-Josef can hold her own against any of the world's best, as a musician first and foremost. A limited number of $25 orchestra-section tickets have been released via this "secret" link for the Thursday and Friday performances. The final performance is Saturday evening. Although the great Béla Bartók of Fischer's homeland will not be heard on the departing program, you might enjoy giving a listen to the masterful set of readings that arguably represents the pinnacle of Fischer's recorded output. 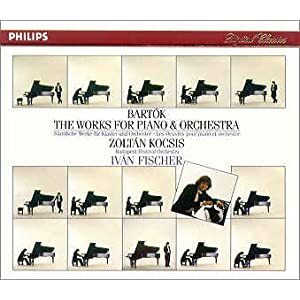 They are Bartók's collected works for piano and orchestra, featuring the brilliant Zoltán Kocsis tearing up the keys, if you can possibly find it anymore . The Adagio religioso in the third piano concerto is total bliss.